The NBA star will need to put up a big season in Los Angeles. For Jeremy Lin, this upcoming season will represent his last best chance of establishing himself as a bona fide talent in the NBA. The NBA’s current lone Asian star was traded to the Los Angeles Lakers two weeks ago when the Houston Rockets decided to dump his $15 million salary for the final year of his three-year contract. While a move to L.A. guarantees nothing in terms of his future prospects, it at least gives Lin a fighting chance for a fresh restart of his pro career. He will need to rebound from his two lost seasons in Houston, where he was never viewed by the team’s management as a vital cog. As Rockets General Manager Daryl Morey went about star-chasing around the NBA, Lin was left languishing on the bench as his playing time dwindled. Things went wrong for Lin almost as soon as he got to Houston in the summer of 2012. Morey traded for James Harden just days before the start of the season and he immediately became the focal point of the offense. Harden is a noted ballhog who likes to dominate the action on the offensive end but is completely disinterested in playing defense. His presence significantly diminished Lin’s value for the Rockets. Then last season Morey signed center Dwight Howard as a free agent in his continuing effort to stockpile star players. Lin was relegated to the bench because Houston needed a defensive stopper in the backcourt to compensate for Harden’s comical lack of defensive effort (see this legendary video – all from the 2013-14 season). While Lin was a capable defender, he could not make up for Harden’s lapses quite like Patrick Beverley, who supplanted him as the starting point guard. But despite averaging only 28 minutes per game, Lin still put up respectable numbers, with 12.5 points, 4.1 assists and 1.0 steals per game. And keeping in character with his humble disposition, he never complained or made waves as a typical NBA player would. For example, his Houston teammate Omer Asik demanded to be traded for nearly the entire season before his wish was finally granted this summer. Lin’s deference to the Houston’s coaches and front office worked to his detriment. Though he has a large contingent of fans, he never saw fit to go public with his grievances. The California-bred, Harvard-grad point guard just carried out his duties as he was told. 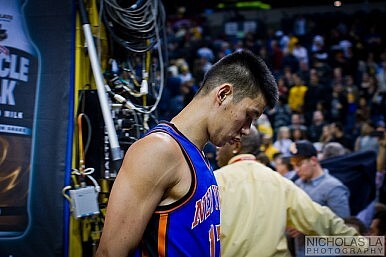 At the end, though, even Lin had its limits when the Rockets visited one more indignity upon him. While the team was courting free agent Carmelo Anthony, it brazenly put up billboards of Anthony in a Rockets uniform – with Lin’s No. 7, as if he’s no longer on the team. A devout Christian, Lin finally responded to this latest, and last, disrespect from his employers with a tweet, quoting a Bible verse. The divorce became official a little more than a week later when the Rockets gift-wrapped him – with a couple of draft picks – to the Lakers for nearly nothing in return, in a desperate move to clear salary space in order to sign free agent Chris Bosh. Houston ended up empty-handed as Bosh opted to re-sign with Miami. For Lin, who’s turning 26 in August and just finishing a weeklong visit to his parents’ native Taiwan, being on the Lakers is an opportunity and a challenge. He must find his role and playing time with a franchise in decay with superstar Kobe Bryant playing out his last years. Lin’s competition for the point guard position is Steve Nash, who’s been plagued by injuries and has played very little since joining the Lakers two seasons ago. It’s likely Lin will get significant playing time even if he has to come off the bench because of Nash’s age (40) and health issues. But even when he’s on the court Lin needs to find a way to be productive offensively because Bryant and the recently re-signed Nick Young are shooting guards who like to dominate the ball much like Harden was in Houston. And with the Lakers’ coaching situation still in the air (though Byron Scott’s hiring seems imminent), Lin has precious little time to demonstrate how he can fit into the team’s new scheme. Lin will have tremendous fan support as his arrival in Los Angeles is warmly welcomed by the Chinese community, one of the largest Chinese diaspora with more than half a million native speakers in Southern California. One noted Lakers fan even offered her spare bedroom for Lin on a Craigslist ad. His arrival also should trigger a marketing boom for the Lakers, the NBA’s marquee franchise, which has won 16 titles but missed the playoffs for only the sixth time in team history last season. They already have a huge following in China and Taiwan – thanks to Bryant’s popularity – and Lin’s presence will only swell the ranks. With all that support, Lin will be playing for his basketball life next season as he’ll become an unrestricted free agent afterward. Without a stellar season, he’s unlikely to get another lucrative long-term deal and a genuine chance to be a starter on an NBA team. Lin will get a fresh start with the Lakers, and perhaps a real shot at stardom. That’s all he can – and will ever – ask for.